According to this Washington Post article, the design of the MLK Memorial was approved by the U.S. Commission of Fine Arts. 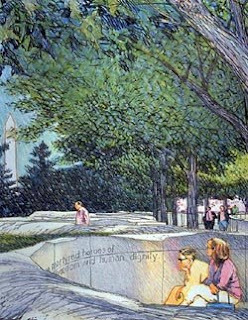 From the article: "The unanimous approval of the commission appeared to clear the way for construction of the $120 million crescent-shape memorial on the northwest shore of the Tidal Basin near the Franklin D. Roosevelt Memorial...Initial utility work began on the site in August, and the memorial is scheduled to be completed in 2010." The creators of the memorial will apply to the Department of Interior for building permits next week. As I mentioned in a previous post, the commission had some issues regarding the design of the sculpture of Dr. King, however, they ended up approving the memorial with conditions.